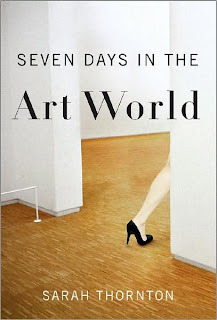 Each of the book's seven chapters follows the author over a single day spent in one of the art world's constituent provinces: a Christie's auction; a CalArts group crit; Art Basel; the Tate Museum's presentation of the Turner Prize; the offices of ArtForum; a studio visit with artist rex Takashi Murakami; and the Venice Biennale. The author calls the work an ethnography and says that she worked as a participant observer in a few of the places mentioned; she does not highlight her methodology in the text (in detail), however, and I would have been interested in hearing more about it. In structuring her book in terms of seven days, she somewhat limits what she can say about each venue as she has, really, only one day to trace out for the reader. Of course, she's picked important days, so it does make sense, but I would have appreciated a slightly thicker description here and there. That would have made the book more formal or scholarly, though, so I see why she chose not to go that way. It's neat to see the art world from varying perspectives. I don't know much about contemporary art, so I enjoyed learning about the artists she mentioned. I did learn that I never ever want to go to art school: an unstructured daylong critique session (like the the one she attended at CalArts) would probably be my idea of hell. I'm 40! Here are a few photos from our long weekend at Mahoney State Park. I can't seem to stop with the Denise Mina (thanks Td and Beth for recommending her!). This was another ebook I got from eReader and read on my Treo. Jamie just finished reading Garnethill on his Treo—he went so far as to say that he prefers it to "real" books! I came a little late to both Denise Mina and Val McDermid, but started reading them both around the same time and soon noticed a lot of similarities. So, I googled "denise mina and val mcdermid" and—what do ya know—hit the motherload: Denise Mina interviewing Val McDermid (from Feb. 2002—told you I was behind). She has a new book out, "The Last Temptation," a tense and disgusting thriller about a serial killer who targets psychologists. The book touches on the heroin trade, the Abanian Mafia, people trafficking and the future of pan-European policing. I had a nightmare the night I finished it and tell Val about it. Mina calls it "tense and disgusting"? Ooooh, I can't wait! Perceptions of crime fiction have fundamentally changed in the past twenty years, largely because of the work of writers like McDermid and Rankin. The new wave of British writing came as a result of the influence of American urban noir. From the cosy, Christie-esque puzzle thrillers set in country houses British, and particularly Scottish, crime fiction has moved the genre into new disturbing areas. The early lesbian and feminist works of writers like Wilson, Paretsky and Mary Wings have made the form uniquely attractive to writers who feel themselves alienated from mainstream writing. McDermid says that straight literature, "Became so self-reverential in the eighties and nineties that it all but disappeared up its own arse. The success of crime fiction shows that there is a place for narrative. Readers want to read it and writers want to write it." I've already started another Denise Mina (Slip of the Knife) and now I can't wait to get more Val McDermid. 1. I haven't finished a book since December. Books I have started and failed to finish reading, through no fault of the books themselves, include: Sarah Thornton, Seven Days in the Art World; Drew Gilpin Faust, This Republic of Suffering: Death and the American Civil War; Agatha Christie, Appointment with Death; Stephenie Meyer, Twilight; and others. Books I had already started reading and failed to complete even as I began an entirely new round of starting to read new books that I have not yet completed include Robert Bolano's 2666 (still working on it) and Robin Hobb's Royal Assassin (OMG I won't give up!). 2. However, all of that is behind me. 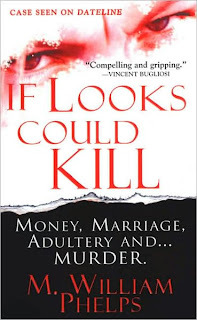 At long last, I have finished a book: M. William Phelps's If Looks Could Kill: Money, Marriage, Adultery, and Murder. Although true crime books are about death and murder, for me, they are comfort reads, mostly because the funny thing about true crime books is that while they have lurid covers and sensational taglines, the books themselves are usually fairly methodical and almost plodding looks at police procedure. I find it calming and even inspiring to read about the gradual accumulation of interviews, strategies, and forensic evidence, and I even love the (usually) one-dimensional descriptions of the people involved. True crime books also often provide an interesting look at a geographical region, and in the case of this book, that region was the section of Ohio my parents live in, so I enjoyed that. I also am usually happy to read about good police work or loyal, dedicated officers. However, the same lists of facts that I find so soothing in these books tend also to mitigate the horror of the crime and reduce it to a logic problem that police work can solve. This is bad, because the truest thing about crime, I think, is that it so rarely makes logical sense: it's committed by people who have been driven beyond logic by desperation, sadness, fear, or desire. If true crime books focused on that, they'd be a lot scarier, but also less reassuring. Also, true crime books rarely sympathize or side with defendants or the accused; they rarely criticize police behavior or procedure; they rarely contextualize crimes in terms of history, gender, race, or class; and they rarely feature good or memorable writing. All of these things are true of If Looks Could Kill. Plus, this book is full of misplaced modifiers and other grammatical errors; I believe it was not copyedited too carefully, which is a shame. The crime: Jeff Zack, an unpleasant man who lived in Akron, Ohio, was gunned down at a gas station by a mystery man driving a motorcyle. Jeff Zack had been having an affair with Cynthia George, the wife of the millionaire Ed George (who, like me, is Lebanese), the owner of the Tangier restaurant in Akron. The resolution: All I can say is that someone probably involved in the crime gets away with it, which doesn't always happen in true crime novels, and which definitely raises the interest level of this one. Like I said before, I enjoyed reading about places in Ohio--Chapel Hill mall, the towns of Rittman and Stow, the Tangier restaurant--that I've been to. I enjoyed watching the case slowly come together. The people in this book were flawed and portrayed fairly realistically, which was a plus, although the defendants were neither spoken to nor interviewed, and thus, their perspective on the crime is absent from the book. Best of all, perhaps, this book got me to pick up my copy of 2666 again, which is also quite influenced by crime/true crime narratives, and which kind of addresss/solves some of the problems inherent in the true crime genre. In 2666, Bolano forces the reader to care about crimes perpetrated against those who are voiceless and poor, people who tend not to matter from the perspective of the middle class. But I will save all of that until I am finished with that book. If I ever am. I read both of these as ebooks from eReader. I didn't realize when I bought it that The Return Journey is a collection of short stories or vignettes. I prefer Binchy's novels—which are pretty vignette-y themselves—so it's no surprise that I enjoyed Whitethorn Woods more.
. . . I watched my mam's life and was determined I would never settle for anything remotely like it. She cooked and washed and cleaned up around my dad and the boys every hour that she wasn't working cleaning office floors or washing greasy plates. "I'm happy enough, Sharon," she would say if I questioned it. "I mean, I love him and we've got to remember that he didn't walk away when I was expecting you." A lifetime of gratitude that he had acknowledged what was after all his child too. Twenty-four years of saying thank you and calling that love.